Rain was falling steadily on a recent afternoon when Roy Brod handed out assignments to his school district maintenance crew. Leaky roofs. Suspicious smells. Water heater problems. The group knew it could be in for a long night. Meteorologists were predicting several days of wet weather. Brod was predicting a thousand work orders for water leaks during that time. “When it rains, we have a lot of calls,” Brod, a construction supervisor, said matter-of-factly. The nature of his business is repairing what breaks in the Clark County School District, the fifth-largest in the nation. He leads the emergency response crew, a five-person team that includes one plumber, one HVAC technician, two building engineers and himself. 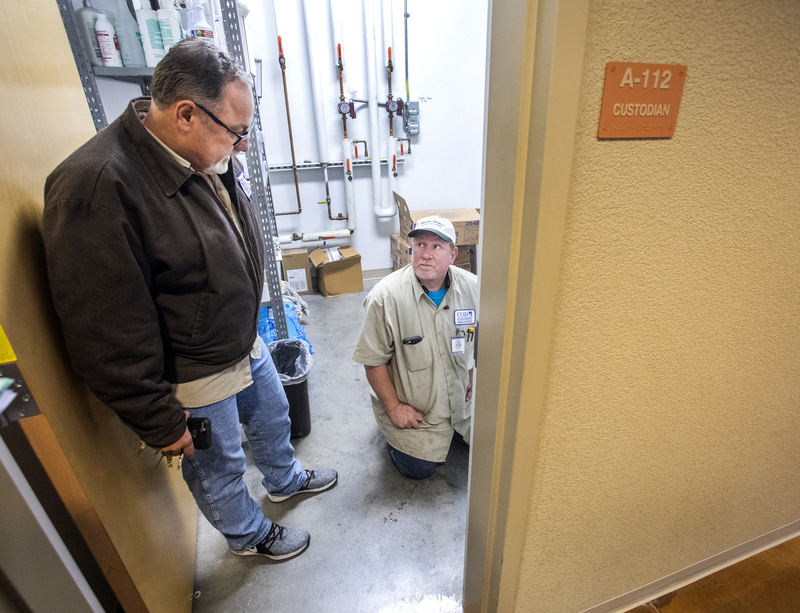 They’re responsible for tending to whatever problems arise in the 8,000-square-mile district from 3 p.m. to 11 p.m.
His first stop on this day is Veterans Tribute Career and Technical Academy, where a staff member reported a water-heater leak. Brod and Michael Abbey, a plumber, arrived within an hour and a half to find a small puddle of water next to the heater. They diagnosed the issue — a cracked drain line — and stopped the leak. They needed a new part to fully repair the drain line. Brod likened their work to triaging patients in a hospital. They bandage broken fixtures or systems as best as possible and then move on to other calls in the queue. Full fixes would come later. The work method speaks to the reality facing the school district. Associate Superintendent Blake Cumbers, who oversees the facilities division, said there are too many needs, too few skilled workers and not enough funding to wrap their hands around all the maintenance problems. The district has capital and modernization needs estimated at $10.1 billion through 2025 but only $4.1 billion allocated. The facilities division also routinely lacks 40 to 50 workers because of vacancies. The 2015 Nevada Legislature gave the school district 10 years of bonding authority to build new schools, renovate existing ones and modernize certain infrastructure. It’s known as the Capital Improvement Program (CIP) and is expected to provide $4.1 billion toward that purpose over that decade. The problem, Cumbers said, is the plan doesn’t take into account the district’s full capital needs — nor can it fund routine maintenance items. Those needs come from the district’s general fund, which also pays for staff salaries and classroom resources. Neither revenue stream is adequate to address all the needs, he said, especially considering the wave of schools that soon will need more major repairs or improvements. The 2015 CIP allocated roughly $1 billion for modernization efforts, which can include big-ticket items like roofs and HVAC (heating, ventilation and air conditioning) systems. But the district’s full modernization needs through 2025 would cost closer to $5.4 billion, according to a program revision approved in June. Furthermore, the program revision notes that all capital needs, including new schools, classroom additions and modernizations, carry a $10.1 billion price tag. That means there’s a $6 billion gap between what the bonding program will fund and what’s actually needed. Cumbers said a financial shortage also exists for maintenance needs that come out of the district’s general fund. The current maintenance budget is about $49 million, which is roughly 25 percent lower than what it should be, he said. Similarly, the grounds budget is $10 million when $12 million is needed. The smaller maintenance and grounds budgets stem from the district’s ongoing fiscal challenges, he said. The district weathered several rounds of budget cuts over the last year and a half to shore up two deficits. The funding squeeze, however, isn’t restricted to Clark County. The nation underspends about $46 billion each year when it comes to building, maintaining and operating K-12 education facilities, according to a 2016 report produced by the 21st Century School Fund, the National Council on School Facilities and the U.S. Green Building Council. 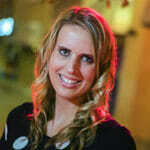 That’s about 32 percent below what best-practice standards indicate should be spent. The first day of school this year proved to be a busy one for the district’s maintenance crews. An overnight storm that caused power outages apparently played a role in the air-conditioning problems, but it wasn’t an isolated incident. The district received 1,707 HVAC repair requests in August. Cumbers said the repair list mirrors the reality facing the large district. On any given day, accidents happen, pipes break and mechanisms fail. Anywhere from 30 to 60 work orders greet his staff each morning. 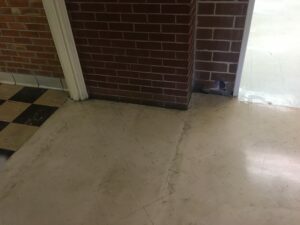 A recent report by the Council for the Great City Schools highlighted the problem, noting there’s no evidence the district has any long-term facilities master plan or formal plan for preventive and routine maintenance. As a result, the district is grappling with a backlog of deferred maintenance needs, which it doesn’t have funding to tackle. The urban district-focused organization sent a team to Clark County in November, at the request of Superintendent Jesus Jara, to evaluate the district’s business operations. The team identified dozens of weak spots in the district’s operations, with a good chunk falling in the maintenance realm. “When facility (roof, HVAC, life safety, security, plumbing, electrical, etc.) systems are not proactively maintained, these systems follow an accelerated deterioration curve and fail prematurely, sometimes years before their designated life expectancy,” the evaluators wrote. The team went on to note that work orders and emergency calls were driving maintenance activity, making it difficult for the department to take proactive measures. Cumbers agrees with the assessment. “We’re too heaving focused on reactive maintenance items — putting out fires, if you will — and not nearly as focused with preventive maintenance,” he said. While funding is one challenge, the other is physical labor. Simply put, there’s not enough of it. The state’s lack of skilled workers — a situation the governor, superintendent and others have vowed to change — is having an adverse effect on the school district. Cumbers said his department has 440 budgeted maintenance positions but about 40 to 50 vacancies, most of which are for skilled trades such as electrical, HVAC and plumbing. Roy Brod, who oversees the district’s after-hours maintenance crew, chalks it up to pay. The district’s starting pay for a plumber with journeyman certification is $21.52 per hour — about half of what’s offered in the commercial sector. Las Vegas Local 525 reports an hourly wage of $44.65 for journeyman plumbers doing industrial and commercial work. “There’s no shortage of work,” he said. Paul Johnson, chief financial officer for the White Pine School District, empathizes with his peers in Clark County. He has been sounding the drumbeat on maintenance needs for the past two decades. The 1,200-student district in central Nevada has two schools that are more than 100 years old and no money to replace them. David E. Norman Elementary School, built in 1909, is a patchwork quilt of various floor tiles and bricks that have been fused together to prolong the building’s life. Constructed without air conditioning or wiring for the 21st century, the school now boasts conduit everywhere to make technology possible. Even if students don’t realize the subpar nature of their schools, district leaders do, Johnson said. The barrier is money. White Pine County has reached its statutory tax rate limit of $3.64 for every $100 of assessed value, and several other counties are in the same boat. Unless there’s a change to the limit or some other revenue stream for maintenance and construction needs, Johnson said he sees no path forward in his rural county. 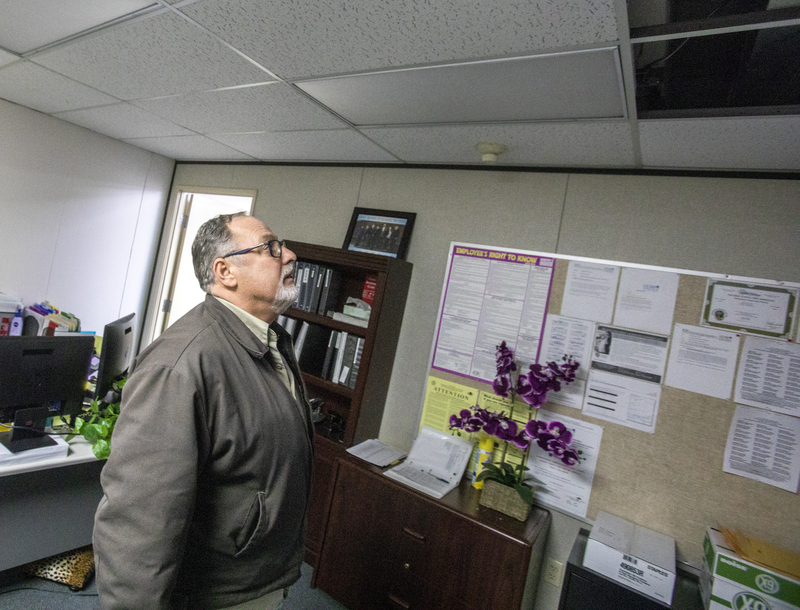 The district’s two maintenance workers will continue patching the faulty infrastructure so the age-battered schools can limp along another day. “These schools, which have already outlived their purpose or their lifespan and should have been replaced years ago, will remain in existence with their flaws with being over a century old trying to provide programs and services for a changing student population,” he said. Johnson fears litigation could be on the horizon. White Pine County schools meet the minimum requirements for the American with Disabilities Act, he said, despite a three-story middle school with no elevator. The district does its best to accommodate children with disabilities on the first floor only, but on rare occasions in the past, staff members have had to carry such students upstairs. Still, Johnson remains optimistic lawmakers will heed his cries for maintenance and capital funding. “Change is inevitable because the way it is working right now is not working,” he said. The reality, though, is that it’s another financial request on an ever-growing list. School districts and education advocates have been pressuring lawmakers for at least the last two legislative cycles to change the way the state funds its public education system. A weighted funding formula, which funnels more per-pupil dollars to schools based on students’ needs, is in the works, as are other programs aimed at boosting student achievement. School shootings, meanwhile, have ignited calls for more safety-related resources. Gov. Steve Sisolak’s proposed budget for the next biennium doesn’t have any specific carve-outs for school maintenance and capital funding. The governor did not respond to a request for comment about whether he would consider directing any money toward that purpose. Organizers behind the grassroots Fund Our Future Nevada coalition, which is advocating for a new K-12 funding formula, said the maintenance woes come down to an equity issue. A new funding formula would take into account students’ needs, giving school districts the capacity to address other issues, such as their deferred maintenance backlogs, said Michelle Booth, the communications director for Educate Nevada Now, which has partnered with the Fund Our Future Nevada coalition. Last summer, Johnson prepared a 25-page report for the Legislative Counsel Bureau and legislative committees that outlines the district’s capital and maintenance challenges. For capital improvements, he recommended a number of solutions: eliminate tax caps or exempt school districts from the combined rate, make it a state bond issue, fund it through a personal or corporate income tax, start a state lottery, or conduct public land sales. The base funding — or per-pupil dollars from the state — should be adequate to fund district operations and maintenance needs, he said. “It will be a good discussion to have when we talk about adequacy and equity,” he said. As the rainy afternoon turned into evening, Roy Brod jumped from the cracked drain line call to one about a burning rubber smell at Desert Rose High School. En route to the classroom in question, he and a building engineer passed a roof leak. Water was dripping from skylights into an atrium area filled with trees. It was fortuitous placement, at least, so they continued toward the classroom. Several sniffs later, along with a visual inspection, they deemed the call a false alarm. Next up: a water leak in a portable office at the Cheyenne bus yard. A trash can was collecting the water falling from a ceiling tile. Another issue mitigated for the time being. Brod climbed back into his truck just before 5 p.m. His phone wasn’t ringing off the hook yet, but he knew the night was young. He longs for the day when he has more crew members on his after-hours team, like he did years ago. “Ideally, it would be nice to have a fully staffed and fully functional night crew,” he said.